Again, I am not so much with the words today. Work had drained most of them out of me, and what was left was banged out of my head with a fender-bender on my way home. Nothing serious, and I wasn't hurt (and even better it wasn't my fault), but my car's rear bumper looks just that much more worse for the wear. More pictures and color commentary after the jump. Aztec Chocolate. The name would have you believe it's brown, right? Well it isn't...really. 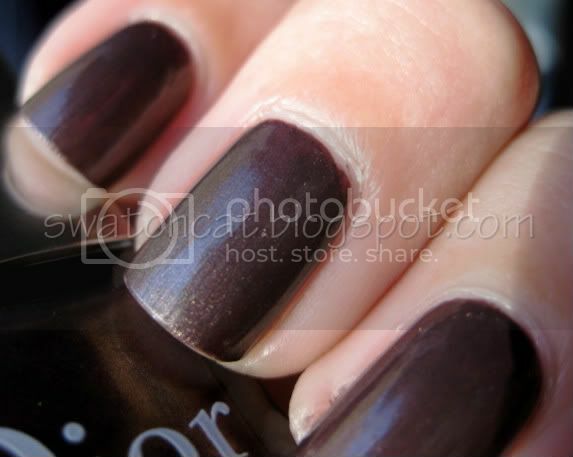 It's a smokey brown-based plum loaded with gold shimmer (not frosty at all, in case that second picture had you worried). Raisin seems like a pretty apt description. 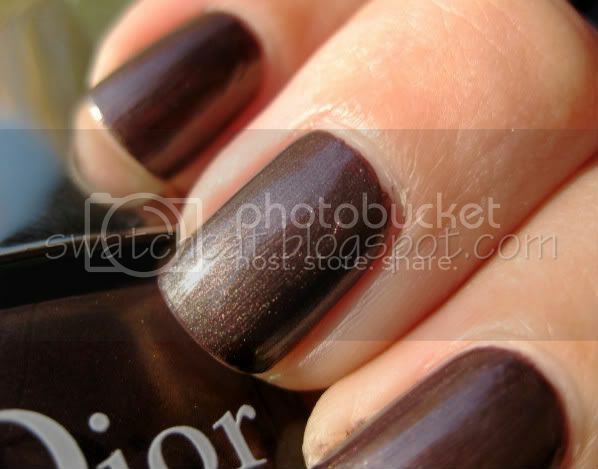 It's mostly plum brown on me, but in some lights the brown undertone comes out. At any rate, I love these types of complex colors. I think two coats would do fine for opacity, but I used two thin coats and ended up having to do a third for full-coverage. 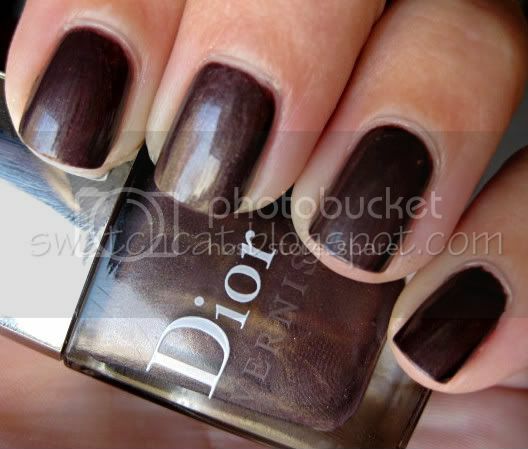 Find Dior Aztec Chocolate on Sephora.com for $21. It is listed as limited edition, so get it while you can. Oh no, I hope your little accident was not too much of a hassle and you are well. 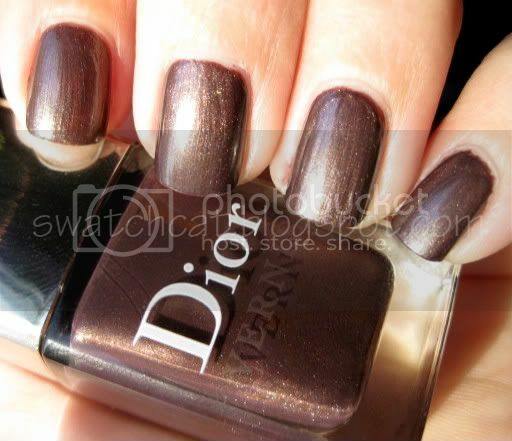 I soo love the colour on your swatches, but for some reason we do not get this here in Europe?! 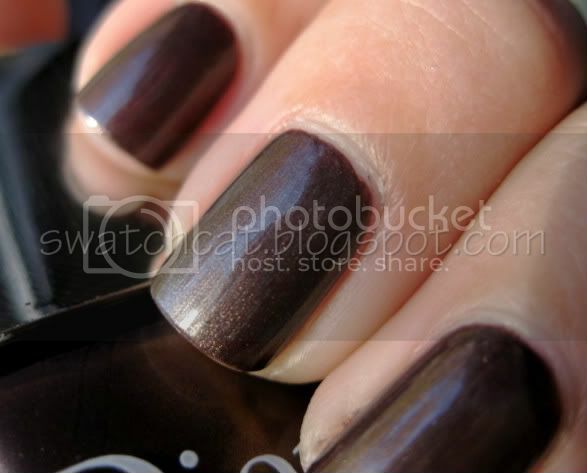 I really hope you can find this polish. It is most definitely worth it! OOhhh pretty! Hope you feel better! Excellent! I hope you like it as much as I do! I am wearing it right now and I love it. Especially in the sun the purple really shows. thanks again for recommending it.